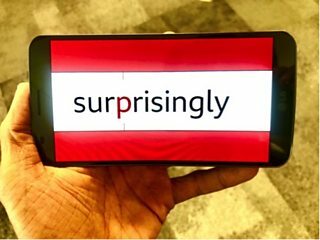 To help navigate a world of ever increasing information, the BBC has worked with a start-up to experiment with new technologies that could enable audiences to read BBC content faster than they ever have before. Cyrus Saihan is Head of Digital Partnerships and explains more on this exciting project. The number of emails, messages and news stories that we read is increasing at a phenomenal rate: the average UK adult now spends more time online and consuming media each day than they do sleeping. We wanted to see what new technologies could be applied to make this overload of information easier for our audiences to manage. Sherlock Holmes and Spock from Star Trek might be fictional characters, but the idea of having a superhuman ability to process information quickly is an exciting one. For this experiment, we worked with the start-up Spritz to see how science and speed reading technologies might be able to help us make our day-to-day lives that little bit easier. The standard way of presenting and reading text is by putting text in horizontal lines and then moving your eyes across a page as you read each sentence from left to right. Each time that you read a word, your eyes look for a certain point within the word. After your eyes have found that point in the word, your brain starts to process and interpret the meaning of the word that you are looking at, before moving on to the next one. It is thought that the eye movement required when you move your eyes across a line in a sentence can take up as much as 80% of your time spent reading. In our experiment, each word shown on screen has one letter that is highlighted red, to draw your attention to that point in the word. That letter is the optimal recognition point in the word and helps your brain quickly process the word, with as little eye movement as possible. The technology that we have used in our experiment works on the theory that, by showing you only one word at a time, your eyes can stay in a fixed position and so don’t have to be constantly moving whilst you read. As a result, the rate at which you can read can be dramatically increased. Having only one word appear on a page at a time when reading takes some getting used to, but from my experience and from testing it out with a few colleagues in the office, the general feeling is that after a few minutes of trying this new style of reading, it becomes relatively easy. The average person reads at a rate of about 200 words per minute, but reading in this way appears to enable you to go well above this average speed. We have put a few different videos in this blog post, showing you what it is like to read one word at a time at a variety of speeds (ranging from 300 words per minute to 800 words per minute). Try them out and see how easy you find it. To get used to the concept, it might help you if you first practice a bit on the slower speeds. Can you read four times faster than the average person (800 words per minute)? Have a go on the videos below and see for yourself. We are reading more and more on mobile phones, but the screen sizes and text sizes of mobiles are smaller than what we have traditionally been used to with books and magazines. Technologies such as this therefore have the potential to make it much easier for us to read on mobile phones. 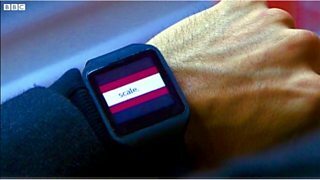 This way of reading could also possibly be useful on devices such as smart watches, which have even smaller screen sizes. Speed reading technology like this might make it much easier for you to read the latest news story on your phone (or watch) when jam packed on a bus or train on your way into work. With the increasing amount of emails, messages and news stories that we see every day, the amount of information that we are consuming on digital devices is constantly increasing. Anything that we can do to make this easier for our audiences is a plus. As well as making it easier, enlarging text in this way also has accessibility benefits as it could help people with poor vision, enabling them to read websites on their phones with a much larger text size than is usually possible. Will we all be speed reading in the future? This is just an experiment, looking at how we might be able to offer a different experience for users of BBC websites, it isn’t something that we are planning on rolling out, it is simply an internal test to see what might be possible. Mobile phones are now able to identify our face and track the movement of our eyes. As that continues to become common place, could we see a situation where every single word that you see on your mobile phone screen moves position depending on exactly where and how you are looking at your screen? Many experts are predicting that augmented and mixed reality devices (which superimpose digital images on your view of the real world) could one day replace mobile phones – if that happens, we might need to completely adapt the way that we read – reading large blocks of text in mid-air might not be possible. Perhaps speed reading text floating in the air, one word at a time, might become something that the children of the future consider to be the norm.